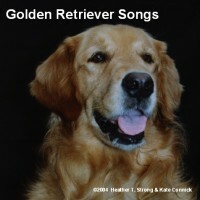 Golden Retriever Songs... and more! Oh wow... this is kind of fabulous. This song is about eating pizza in front of a Golden Retriever. I LOVE how she belts out "CHEEEEEEESE!" at the beginning, and then how she describes how grease drips down her wrist. Heather's own description: "A trio of frustrated Boxer owners learn to come to terms with their dogs' lack of perfect obedience." This one's got a lotta soul, I tell 'ya. Heather's description says it all: "Inspired by Perdue's recent research study, this is a jazzy reminder to Scottie owners to avoid using lawn-care chemicals." This one is written from the P.O.V. of President Bush's dog, Barney. Heather's description: "President George W. Bush's little dog is a Scottish Terrier named Barney. Some folks like the President, and some don't... but what would Barney say?" I'll be honest... this song did bring tears to my eyes. It's about a Golden Retriever who's slowing down with age.